"A" is for AIDS. "B" is for bloodshed. "C" is for child brides. 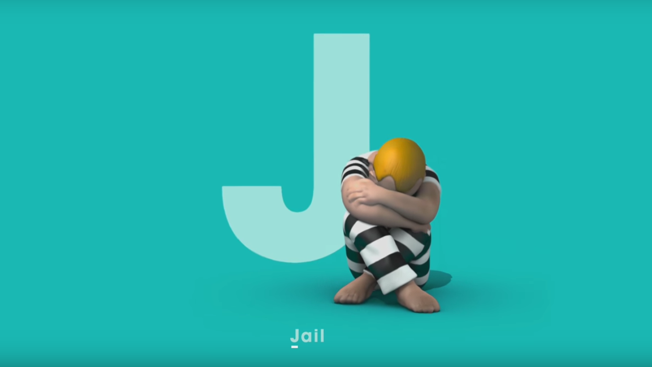 A new ad imagines the alphabet as a set of abbreviations for all the awful consequences of not being able to read. Then it sets the whole thing to a singsong melody, with cartoonish little sculptures illustrating largely macabre subjects. "K," meanwhile, is for Kalashnikov. Naturally, a little boy wields the rifle. There's some overlap in the profiles of the victims; certain types of violence and inequality particularly target women and children. The video recalls, first and foremost, the Edward Gorey picturebook The Gashlycrumb Tinies, which taught the alphabet, letter by letter, through the depiction of the deaths of children. The new spot's trinity of nursery music, dark subject matter and simple illustrations also can't but evoke "Dumb Ways to Die," the viral train safety PSA for Metro Trains Melbourne from McCann Melbourne that swept Cannes Lions in 2013. But there's little humor in this video, titled "The Alphabet of Illteracy" and created by agency FCB Inferno, with help from artist Wilfrid Wood. The jokes are limited to depressing sight gags, like an overweight pink man chomping on a donut and sinking his end of a seesaw while a skinny black child starves and dangles in the air on the other end ("M" is for malnutrition). In fact, you'll find a plethora of upsetting details, sometimes particularly clever in their conception: For "Radicalization," a snake slithers its way into the ear of a young man. Overall, it nets out as a powerful piece of work, even if risks seeming goofy—especially on repeat viewings. But the content is so horrifying that it seems more likely to engender discomfort among the audience—though at nearly 3 million YouTube views, it's drawing plenty of praise from commenters. Whether it's likely to spur action, and how much literacy can actually do to cure the many societal ills listed here, are different questions. But it certainly makes its point memorable … even if it might ruin the alphabet for anyone exposed to it.